The NextGen Gallery plugin for WordPress is one of the more robust gallery plugins currently available for the open-source platform, unfortunately once installed the plugin is called every single time a page or post is accessed by a user. If you’re familiar with server load times at all you know that unnecessary script calls in turn make your website slower. That’s exactly where NextGen Gallery Optimizer for WordPress comes into play. Using this plugin developer Mark Jeldi has made it simple to ignore the NextGen Gallery plugin script and style calls on all posts where the Nextgen shortcode [nggallery id=x] is not being used. To start using the plugin simply search for “NextGen Gallery Optimizer” in your “add new plugins” section of your WordPress setup or download it from http://wordpress.org/extend/plugins/nextgen-gallery-optimizer/ and install the plugin in your plugins program via FTP or through the upload function. Notice that to get started all you have to do is choose the NextGen Gallery theme or the URL path to a custom theme you are using and then choose if you want the plugin to support the Fancybox lightbox effect. By selecting the lightbox effect option you now have that feature sync’d with NextGen Gallery as an added bonus. Mark says he included Fancy Lightbox integration after realizing that many NextGen Gallery users were having problems getting the two to work properly together. 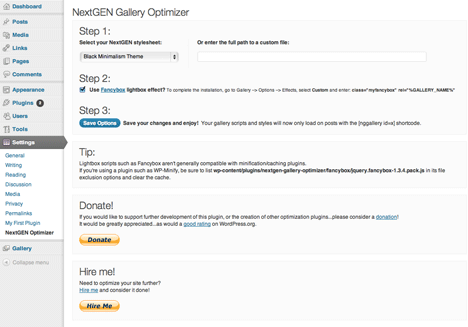 “NextGEN Gallery Optimizer ONLY looks for the [nggallery id=x] shortcode, and ONLY on Posts! This means it will not add scripts and styles on posts embedded with NGG’s single images or slideshows, or add anything on WordPress Pages…well, at least not yet! The plugin is still a work in progress, however I downloaded and installed the plugin on a test platform and found that the NGGallery script wasn’t being called when the gallery wasn’t available on my posts and those posts saw increased load times after the plugin was installed, verifying the authors claims of faster WordPress load speeds. Give NextGen Gallery Optimizer for WordPress a try today and let us know what you think about it’s simple to use features and increased performance. padded cover and comfortable-touch interior lining.